If you are maintaining the UK’s largest dockside cranes it makes sense to hire the UK’s largest powered access machines. 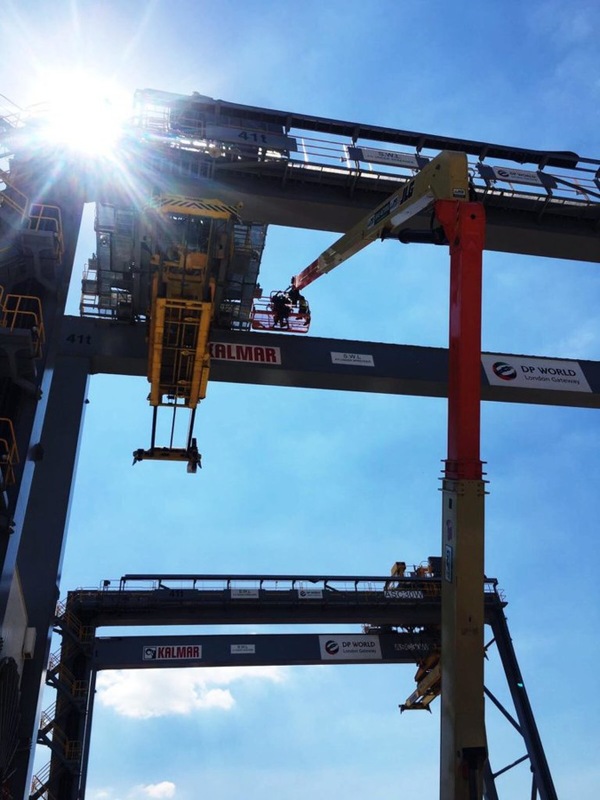 JMS Powered Access machines are being used exclusively to maintain dockside cranes at the DP World London Gateway Port on the River Thames Estuary. A crane maintenance contractor is using a range of aerial platforms hired from JMS – including ultra booms and scissor lifts – to work on the cranes, which at 138 metres tall, are among the biggest in the world. Maintaining the cranes is vital to loading and unloading operations at the port, one of the most important commercial import-export gateways in the UK. 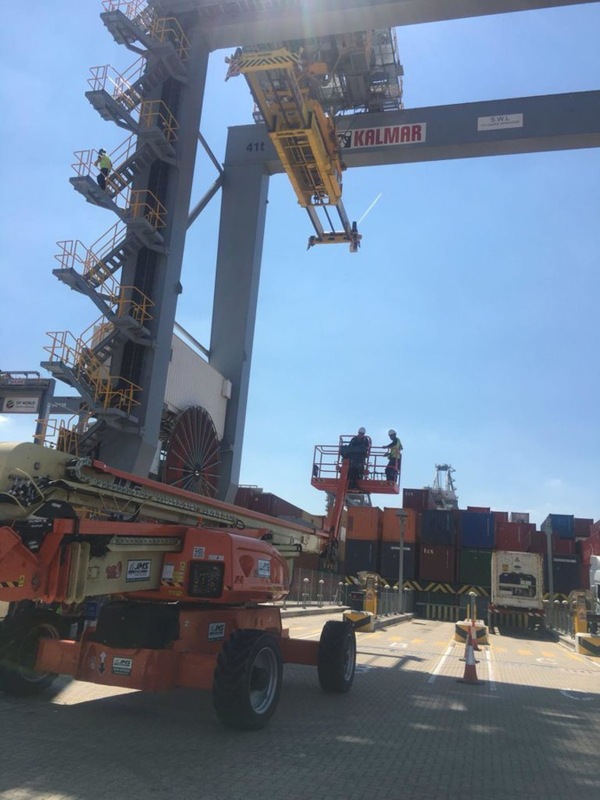 The powered access platforms hired from JMS have been selected to support the repair and servicing of automatic stacking cranes at the port. And the Skyjack 4632 electric scissor lift, which has a working height of 11.75 metres, and a 1.22-metre roll-out deck. The aerial platforms are used to carry out structural inspections and facilitate the removal and installation of parts, including electric motors and lifting equipment. Key benefits delivered by the mini fleet of JMS aerial platforms on site include industry-leading safety features, flexibility, and the speed and precision with which they can be operated in a live dockside environment. DP World London Gateway is a continuous high-speed operation, with average truck-turnaround time of under 40 minutes and an average container turnaround time of 20 minutes. JMS Regional Account Manager Paul Hollands said: “With this incredible turn-around time, every minute lost when a crane or automated loading machine is out of action is a significant cost to the business. “The JLG ultra-booms are powered by low-emission diesel engines so can operate continuously, even in poor weather conditions that would prevent some other platforms from working. JMS providing powered access for clients with maintenance tasks at height. JMS’s aerial platform hire fleet has some of the largest ultra-booms available for hire in the UK, with the JLG 1350SJP and the JLG 1250AJP being just two examples. Both platforms are equipped with articulating jibs for fast and safe platform placement. Both also have four-wheel-drive and four-wheel-steer plus oscillating axles for superb worksite mobility, which is essential in controlled spaces like docks. The excellent reach of both machines allows them to be placed in safe and secure locations, without disrupting ground-level operations. The JLG 1250AJP also has JLG’s QuickStick boom design, greatly reducing lift and lower speeds. In action with the JLG boom at the iconic DP World, London Gateway. The Skyjack 4632 battery-powered scissor lifts, the largest of Skyjack’s Conventional Series of electric scissors, are used to maintain cranes and lifting equipment taken into the port’s maintenance centre. 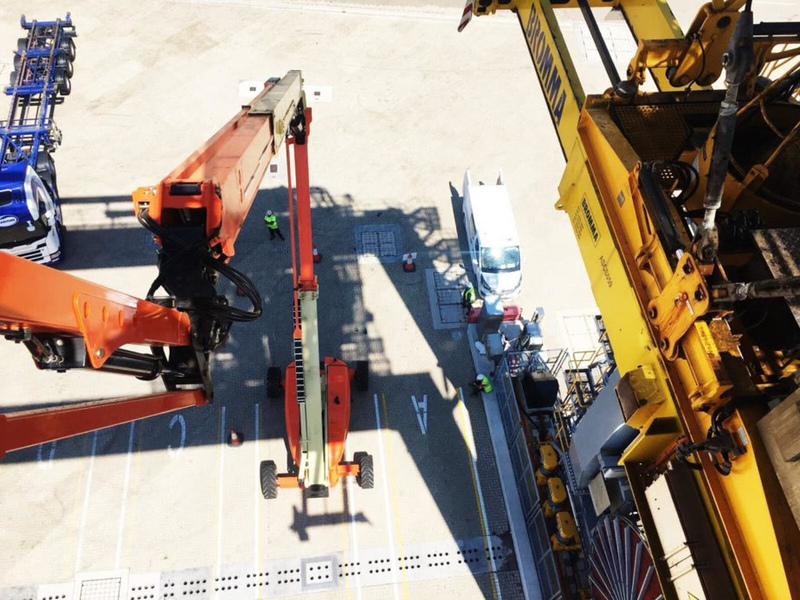 Their 317kg platform capacity and large working platform area, plus the roll-out deck, allows crane maintenance engineers to work up and around large pieces of equipment, carrying all the equipment and parts they need. Paul Hollands said: “JMS provides the right powered access machines, even for these challenging operations, and we also pride ourselves on the level of service we deliver as well. JMS’s access platform fleet is in constant use at the highly-automated deep-sea container port and logistics hub. As well as having record-breaking cranes, there are 60 automated stacking cranes and 180 transaction bays. The port also has the UK’s longest rail terminal and three rail-mounted gantry cranes. JLG Cherry Picker at the DP World, London Gateway. 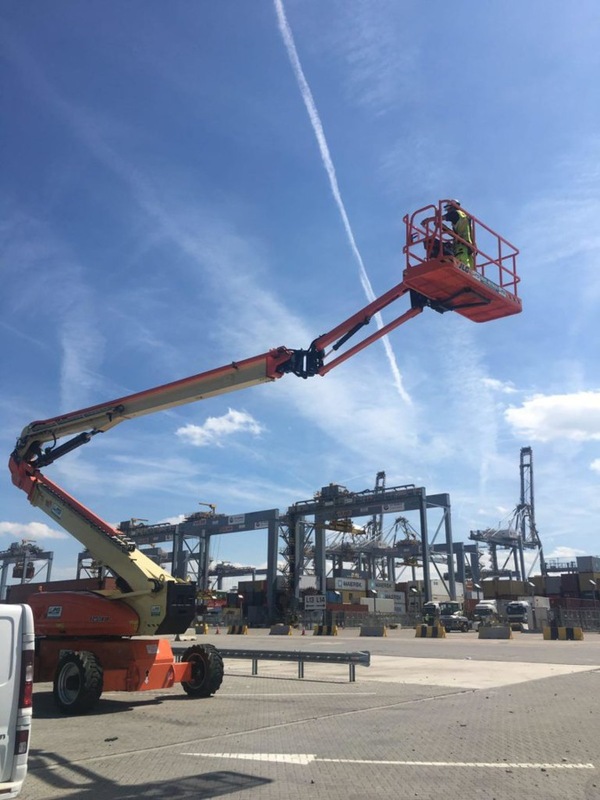 To find out more about ultra-boom hire and scissor lift hire options from JMS, including the powered access machines used at DP World London Gateway, call us today. JMS also has other powered access equipment available for hire, such as tracked spider booms, and low-level access machines, including personnel masts. If necessary, we can supply fully-trained and highly-experienced powered access operators to support your project. JMS also delivers a range of training including IPAF training, so your teams can always work safely at height.